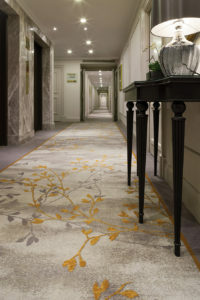 Ulster Carpets worked with GA Design to create stunning bespoke woven axminster carpets for corridors and guest rooms in Grosvenor House, A JW Marriott Hotel, London. This historic 5 star hotel is located on the famed Park Lane in London’s Mayfair district, close to Oxford Street, Buckingham Palace and Hyde Park. It was the lush parkland which inspired the sophisticated carpet design. A delicate foliage pattern gently winds through the corridors. Rich golden leaves are carefully layered over soft greys to create depth and add warmth. This beautiful autumnal effect continues into the elegant guest rooms linking them to the corridors by colour and pattern. Ulster has a long established relationship with the Marriott group having completed a number of projects in cities around the world including Paris, Amsterdam, Moscow, Munich and Dubai.